What is a good way to store road salt? For bulk salt supplies, one popular option is to store the material in a maintenance-free, relocatable fabric structure. After a very harsh winter last year, public works officials and small business contractors involved in deicing roads and highways have stocked up on sand and salt. Many newcomers to the industry often assume that storing road salt in any way is acceptable, but the contrary is true. In actuality, storing salt improperly can have a serious impact on the environmental health of the surrounding area. The biggest issue surrounding salt storage is stormwater runoff and potential contamination to streams, aquifers and other major bodies of water. This can have damaging effects to animals, plants and people. For bulk salt supplies, one popular option is to store the material in a maintenance-free, relocatable fabric structure. There are many advantages to storing salt and mixed sand/salt under cover. Sand/salt storage buildings minimize the possibility of contaminating ground and surface water with salt runoff. The buildings eliminate the economic loss of salt that is dissolved and washed away by precipitation. The shelters help ensure that the mixed material is easy to load and spread. Thankfully, covering stored road salt no longer needs to be extremely costly, due to a number of technological advances. The benefits of properly covering stored road salt are visible in both economical and environmental ways. 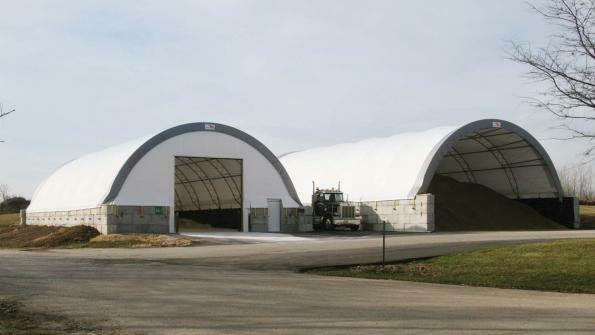 ClearSpan Fabric Structures offers sand and salt storage buildings. The company’s structures feature American-made, triple-galvanized steel frames. Each structure features no internal support posts, allowing for the maximum amount of storage space possible. When it needed to replace its salt storage building, the Stephenson County, Ill., Highway Department elected to install two ClearSpan fabric structures. The 45-foot-wide by 90-foot-long structures provide proper storage conditions and offer other improvements, according to the company. For more information on ClearSpan Fabric Structures, contact a Truss Arch Specialist at 1.866.643.1010. Editor’s note: ClearSpan Fabric Structures provided the content in this item. In the video, watch from start to finish as a ClearSpan Fabric Structure is erected.